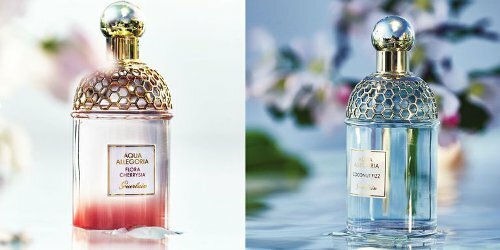 Guerlain will launch Flora Cherrysia, Coconut Fizz and Ginger Piccante, three new additions to the Aqua Allegoria line. Flora Cherrysia ~ focused on cherry blossom, with additional notes of bergamot, pear, violet and white musk. Coconut Fizz ~ with bergamot, melon, coconut, tonka bean and sandalwood. Ginger Piccante ~ with bergamot, ginger, rose, cedar and white musk. Guerlain Flora Cherrysia, Coconut Fizz and Ginger Piccante will be available in 75 and 125 ml Eau de Toilette. I am not sure mostly because I haven’t liked any of the Wasser AAs…they are all clean white musk things on me. But we’ll see. Agreed – the ginger one might be worth trying; I always appreciate the freshness and zing of ginger. Ginger Piccante is the only one that sounds appealing to me. Looking forward to its release. Does anyone else find the name “cherrysia” too weird? I googled it out of curiosity and it is apparently a place in Pokévision (a Pokémon app). If the ginger one dropped in my lap I’d test it. The only Guerlain scent I wear is Pamplelune and I consider it a masterpiece! I’m hoping the Ginger Piccante is up to those standards – that’s the only one of this trio I’ll be sniffing. I bought the 75 ml AA Flora Nymphea at half off, unsniffed, like an idiot. Have worn it maybe 3 times in as many years. The line reminds me of regret. Lol, your post immediately made me think of a line from an old Will and Grace episode. The AAs are so enjoyable for summer. I have Pamplelune, Herba Fresca, and Limon Verde and would probably own others if samples were easier to obtain than having to resort to evilbay. I want to try all three of these. Re: the Coconut Fizz, just thinking of melon and tonka together made my stomach hurt. Nice bottles though. Just spritzed a bit of Ylang Vanille, my one pastry perfume. I like the names and I want the 3 of them.